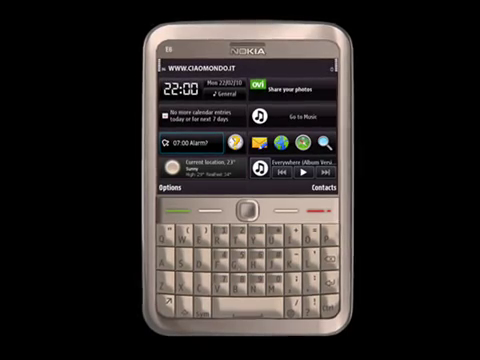 Thanks to our reader calvin, we received a schema video of Nokia E6-00. Not sure if it is the right design or not but the design sure fits into the rumors that has been leaked about this device. There are reasons to believe that this might be just a design based on the rumors, but it looks interesting for sure. Noticeable is the high resolution Symbian^3 styled widgets on screen, fitting the rumor of its being a Touch-n-Type device. We have seen Touch-n-Type in S40 segment only till date and yet to see that how it will take it shape in such form factor. The design of Call and Call End keys also fits into words from Alex68 and Eldar. The long space bar like we seen in Nokia E71 and Nokia E5-00, the design seem to have a bezel around like E72 and if specs are as high as noted in many forums, then sure it might fit into next buy for many. The things that makes it look like a fake or just design are absence of visible proximity sensor and front camera and somewhere it look like someone taken the photo of Nokia E71 and enlarged it to fit Symbian^3 screen into it (though we seen such widgets in leaked Nokia N86 processor though), but who doesn’t love the rumors? If you were not following the rumors around Nokia E6, then the E72 successor seems to be a touch-n-type device with around 2.8” screen with a superb resolution of 640×480 VGA screen (just think of pixel density) though Symbian^3 devices been 640×360 nHD due to limitations in OS, but may be Nokia has crossed over those limitation. It is also rumored to have a 8MP camera like C7-00/E7-00 with LED flash and also rumored to come with new version of Symbian^3 firmware with browser 7.3. What you think about it? You can also send your tips on nitish@nitishkumar.net anytime. I am all for it. It may be E6-00 but looks more like an artist rendition to me. yeah it seems unlikely but it would be part of next segment of devices and there should be some common link among all of them. May be new resolution? pretty sure that’s just another photoshop… The keyboard and d-pad look suspiciously the same as Nokia E5 (using one right now) and the lack of (at least) proximity sensor for a high end device (at least compared to my E5) seems strange. Wow, thats a really clever way of thkniing about it!